Check your calendar: It's 2246, and the galaxy just isn't what it used to be. Spacefaring pirates roam free, civil war rages, and simple traders cheat death to make a living. Welcome to life in the 23rd century! Ambrosia Software's Escape Velocity puts you smack-dab in the middle of that booming galaxy. As the captain of a shiny new spacecraft, you make your fortune and build your empire. If that sounds like a walk in the park, you're in for a surprise—dangers abound! Your lowly shuttle craft will need more than a little luck to make a profit... and survive. 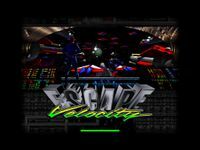 Escape Velocity offers a rich and open-ended environment that evolves as you play. Over a hundred worlds occupy the galaxy, each with its own technology, alliances, and commodities. As you earn credits and gain fame, Confederation peace keepers and Rebel patriots struggle for power, leaving you in the middle.